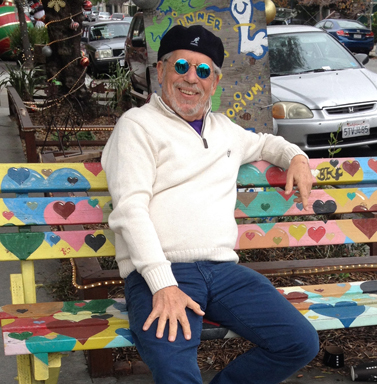 I arrived in San Francisco fresh out of college in 1968 and began working for the American Conservatory Theatre. I was an unknown bit player, playing my part, living out my role, along with a large cast of actors, directors and production people. This was my San Francisco family. My life revolved around the Geary Theater, built in 1910, a few short years after the great 1906 earthquake that destroyed much of San Francisco. It is a beautiful grand old ornate theater, and like the city itself, loaded with history. There were nights when after the curtain came down and the audience had filed out, I’d stand on the stage just looking out upon the 1000 plus empty seats. All the ghosts of past performances were still there, as were the memories of the theatre legends from all over the world that had stood on that very same spot on the stage. In those moments, I was among them, this little kid from Farmington California population 210. Just look where I was standing. This was an important time in my life. It was here that I learned a most valuable lesson, the power of having a dream. From that moment on, I knew that if I had a dream, it could be achieved. Fast-forward 44 years and a return visit to San Francisco. It was the day after Christmas 2013 when I arrived with my wife Marylou, my son Matthew and daughter-in-law Lizet. We were there to visit Nathan, my oldest son who now lives and works in San Francisco. Nathan has taken my place and walks the same streets I traveled as a “local” in the late 60’s. On this trip I was revisiting and sharing memories as well as seeing San Francisco today through my son’s eyes. To better explain my early days in San Francisco to my family, we boarded the number 71 Muni bus and headed toward Golden Gate Park. Our first stop, the corner of Height and Ashbury Streets, the heart of the legendary “Hippy” neighborhood know as The Height. To celebrate this reentry into the past, I entered the nearest “Hippy” store and purchased an old remembrance, a pair of round lens dark blue glasses. Just like John Lennon of the Beatles wore back in the day. As a naive 20-year-old, I walked these streets learning things I didn’t know I needed to learn. They called it “The Summer of Love”, when as many as 100,000 people converged on this neighborhood, initiating a major cultural revolution that focused on art, music, painting, and poetry, while at the same time exploring new political and religious movements. We dressed different, we looked different, and some of us even smelled different. This scared the hell out of our parent’s generation, and they wanted all of this craziness to stop. Lines were being drawn in the sand between two opposing ideas of what life should and could look like, and the status quo. Of course we judged them as being old and out of touch, and were judged in return for being “crazy hippies” who needed to grow up. Our country, or for that matter, the world hasn’t been the same since. However this day, as I peered through my dark blue John Lennon glasses, I saw a Height Ashbury that has changed. It wants to be the same as back in the day, but it looks and feels like a movie set trying to act like The Height of old. Its people are attempting to play the part by dressing up, but they appear as weak images of my memories. The buildings are masquerading hidden behind a freshly painted face, but the colors are not quite right. What my heart saw was that the passion was missing. Forgotten were the dreams of creating a better life and times. The Height was now just another destination on the tourist map. Even wearing my John Lennon dark blue glasses could not hide that fact. The following day we met up with one of Nathan’s San Francisco “family members”, Cedric The Cable Car Guy. The Mason Powell Cable Car runs past the front door of Nathan’s workplace, which is how Nathan becoming friends with Cedric, a cable car gripman. He is the driver” who guides the cable car up and down the steep hills of San Francisco between Fisherman’s Wharf, North Beach and Downtown. That day we were headed downtown to go shopping. Nathan, as our tour guide tells us, “I’ll call Cedric and see if he is working today, and we can catch a ride”. Good news, Cedric will soon be at the end of the line in North Beach with his cable car. I wondered what the crowd of hundreds of tourists waiting in line thought when we boarded ahead of them and they heard Cedric refer to us as “family”. On the outside we certainly didn’t look related. Cedric who was born and raised in San Francisco, stood 6 foot 2, and was African American. We, on the other hand, on a good day might push 5 foot 6. Our roots are white and lead back to France by way of Canada. What the tourists didn’t understand was that this was San Francisco, and “family” transcends genetic ancestry. Nathan mentioned to Cedric that we were going shopping at a particular store downtown by Union Square. Our thought was that we would just get off at the end of the line and walk the two blocks back to the store. However, Cedric had other thoughts. When the cable car reached the store, which was in the middle of the block, Cedric stopped and let us off. Traffic is now backed up behind up behind us, and tourists are hanging off the cable car staring wondering what is going on. Cedric calmly proceeds to climb down into the street, comes over to where we were standing and gives us all a huge hug goodbye, then hops back on the cable car and heads to the end of the line. Yes, we are family! On the last day of our visit, I found myself again standing at the Mason Powell Cable Car turntable reflecting on all that had taken place the past few days. What wonderful memories had been shared with my family! Standing in front of the Geary Theatre having my picture taken with my two sons, each sporting beards and it looking like we belonged, three pieces fitting together. Setting foot in the Height wearing my dark blue John Lennon glasses. Riding a cable car, probably the exact same one that I had taken many times back in the 60’s. San Francisco for me is much more than simply memories from the past. It is a part of me, my second home, and an important chapter that greatly shaped the person I have become. For 5 days in December of 2013, I walked those streets again, experienced that special feeling of being a part of that great city. More importantly however, I shared San Francisco Days and San Francisco Nights with the next generation of my family, so that the memories would not die. And who knows, perhaps 40 years from now these same stories I have shared with you will be passed on and lived by yet another generation. Long live San Francisco Days and San Francisco Nights. Your Biggest Gift . . . Wonderful, marvelous, precious, story and memory — thank you. My mother was born in San francisco before the 1906 earthquake and her family was burned out by the fire then. My son loves there now, and I love San Francisco too. Loved reading your story Alan. I’d love to see the picture of you and your 2 sons!